No matter how busy your life is, you will be touched everyday as you learn to trust and rest in the Presence of God. 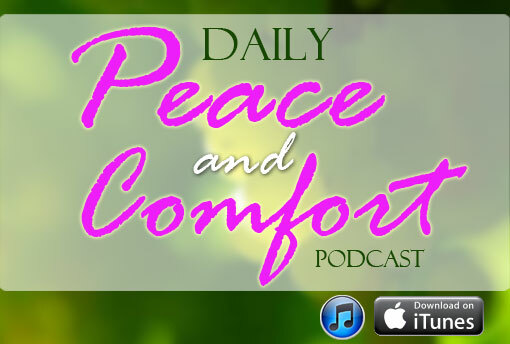 A daily devotional that speaks to your heart. Each devotion has amazing relevance to life and daily situations. Spend time with Jesus when you start your day and your life will be so enriched! God knows how most of us want to break free from our financial problems & responsibilities. He hears the concerns of our hearts and it saddens Him when we choose to turn to people for answers. God wants to remind us today that when we place our HOPE on anyone or anything other than HIM, we are setting ourselves up for disappointment. But when we focus all our efforts in knowing what pleases Him & following it, blessings shall follow. Only in God’s ways can we be assured of true abundance & freedom from our fears. Do you long for a LOVE that lasts a lifetime? The kind of love that cares, comforts, guides and will never leave? A love that gives security “forever”? Most of the time, God has already given us all that we need without us being fully aware of it. Today, God wants to remind us that the love of a lifetime is within our reach, for He has already given Himself to us – His very own spirit – the Holy Spirit. He freely gave Himself to let us know that in Him, we are complete; in Him, we have EVERYTHING, and that HIS LOVE is more than ENOUGH. Sometimes, God allows failure & disappointment to happen no matter how perfect our plans are to remind us that we can never succeed without HIM; that if our motives are not “united” with His perfect will, we can’t expect it to come to pass. The Bible declares, many are the plans in a man’s heart but it’s the Lord’s purpose that prevails. God loves us deeply & has already prepared a great plan for us. As His children, we should make a conscious effort to “include HIM in every decision” we’ll make because when we are united with God, nothing will truly be impossible for us. When faced with an impossible situation or a difficult trial, we hold on to the thought that the God we have in our lives is so powerful that He can fix everything. Yes, that is true, but do you know that as His children, He has also given us the power to overcome difficult things in the world through the power given to us to LOVE and HATE? Today, we will learn that by putting these emotions into the right action, we can truly know what is means to become victorious in every problem that will come our way. Being able to freely express our feelings through Social Media is a gift given to us by God. That’s why we as Christians are expected by the Lord to always conduct ourselves in a manner worthy of the calling He has placed our lives. Today, God is reminding us not to imitate the world & exercise self-control whenever we go online. We need to realize that we are living in challenging times where we will be constantly tempted by the enemy to react impulsively & speak negatively. Our Father wants us to always remember that “we are His children” & if we really want to win the world for Jesus, make a difference & have a blessed life, we need to represent Him well. Being a light in a dark & troubled world is not easy. Today, God wants to remind us to always exercise awareness & self control whenever challenges come our way. Why? Because we carry the name of our Lord Jesus Christ wherever we will go – even in Social Media. We may be provoked at times to post, like or say things that goes against the Lord’s will – but, we should remind ourselves always that social networking sites present a great opportunity for all of us to let our light shine before others & show the hope we have in Jesus. Let us use our words to build others up, rather than tear each other down. A person who has completely surrendered his or her life to Christ can expect the hand of God to move in his behalf. Sometimes, we find it very difficult to get the things we want; but the truth is, all we need is to take that leap of faith and wholeheartedly follow what God has instructed us to do. God wants to remind us today that He has created each one of us for a very special purpose. Troubles may come, but God’s blessing and favor will never leave us. As long as we stay under His will and recognize the “assignment” He has given us, we can be assured that God’s hand of protection & direction will always be upon us. When non-stop failure happens to us, whether it be in our personal, financial, professional, or spiritual life, we tend to beat ourselves up with so much regret & find it hard to get up and try again. God is reminding us that the very reason why we are still alive & breathing today is because He has not given up on us. He wants us to recover & start over. Our God is a Father who gives us chances to correct everything we have done wrong in the past. All we need is a realization of His great love for us. His desire is for us to move forward from our failures & live with a brand new way of thinking. So, cheer up! Remember that God’s mercies are new every morning! Something new is definitely coming our way! [ “Because of the LORD’s great love we are not consumed, for His compassions never fail. They are new every morning; great is Your faithfulness. Whether we like it or not, we live in a world that is always changing. People change, circumstances change. Sometimes, God allows these disappointments to show us that HE alone is the STABLE ONE in our lives; the ONLY ONE who will never change and will never leave us. In every crisis & failure, there is a hidden opportunity – an opportunity to make things better. In times of fear & depression, God extends His love for us. In return, He wants us to spend quality TIME with Him. Time is very important & the most precious gift we can ever give God. Our time is more valuable than anything we can lay upon the altar before the Lord, because whenever we spend time w/ Him, in worship & in studying His Word, we get to know Him deeper way & He is able to lead us to a life of peace & freedom that our soul always longs for. When storms come & we don’t know who to hang on to, God is reminding us to change the direction of our eyes & look upward to HIM – the God who can save us from anything! Remember that no problem is too hard for Him. His powerful hand can turn our uncomfortable situation today into an avenue for greater blessings tomorrow. Sometimes, seeing other people’s success makes us wonder if God can do the same for us. We can’t help but ask Him: Lord, what about me? Will my time ever come? Can I also experience the good things these people are enjoying for themselves & their loved ones? Will my troubles end? Will I ever move forward from the pains of our past? The simple answer God wants to tell us today is YES, He can do the same for us. He wants us to remember that just because our lives hasn’t turned out the way we thought it should, it doesn’t mean that a better tomorrow will never come. “Good changes” will always be available for everyone. All we need to do is believe that the discomfort we feel today is an important puzzle piece of the greater future God is preparing for us.